Want to learn more about the science behind the oil spill and what sorts of wildlife is being affected? 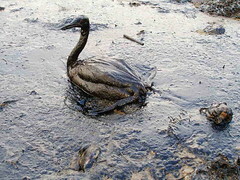 This website focusesÂ on the species and habitats that are being affected by the oil spill. This website hosted by The Smithsonian isÂ a collaboration between agencies such as National Geographic, Monterey Bay Aquarium Research Institute, BBC Earth, and many others. It’s atrocious what’s continually been done to our environment. Repeated mistakes of this magnitude are unacceptable. Thanks for getting the word out for those who truly care.